In 2015 domestic and international auto shows focused heavily on light-weighting through the integration of composites within vehicular structural design. However, few attendees were even aware that composites were also pushing architectural designs skyward in the exhibition areas prior to the introduction of next generation production vehicles. 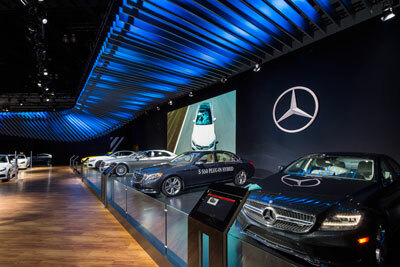 In November of 2014, Dimensional Communications Inc. unveiled a 17,000 square foot exhibit space to showcase Mercedes- Benz USA’s 2015 worldwide lineup of luxury vehicles. The space was filled with vehicles, technical displays, lounge spaces and lighting features. Hanging above the space was a custom designed display named the “The Silver Flow,” made up of 125 individually pultruded fiberglass lamellas. In 2013, Daimler AG called on the marketing and branding exhibition veterans at Dimensional Communications Inc., with over 50 years of custom build and branding expertise, to develop the U.S. version of The Silver Flow. Panels in the European display were made of aluminum, which were too heavy for certain U.S. event spaces and could only be used once before needing replacement. Daimler AG requested Dimensional Communications Inc. make a version for American shows that could last at least five years and travel to different shows for repeated use. The team at Dimensional Communications Inc. wrestled with the European design, ultimately deciding weight and durability could be achieved by using Strongwell’s pultruded FRP at custom lengths ranging from 4 to 20 feet. Each custom FRP component measured 16 inches in height and 2 inches in thickness. This alternative option of integrating a lower-cost fiberglass design also reduced the need for custom connections and supports for setting up the display while maintaining a weight well below the structural roof threshold of each convention center. By painting the lamellas, the fiberglass version of The Silver Flow resembles its aluminum European counterpart while saving weight, simplifying installation, and being durable enough to endure multiple auto shows. Each lamella fin was custom designed, painted with an aluminum look finish and specifically fitted within the architectural design, allowing setup and tear down to take less than two days. To view the case study, click here.